B-D Cylinder Products, Inc. is committed to meeting and exceeding our customers' expectations in terms of the quality of the products and the services which we provide. With our quality system, we are committing ourselves to a strategy of continuous improvement, seeking to learn the expectations of our customers and striving to meet and exceed those expectations. and maintain a "partnership" with them. Maintain our reputation for quality products and service. 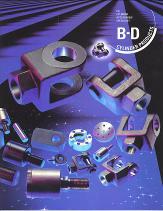 The entire B-D Cylinder Products team must adhere to the spirit and the letter of the firm's quality policy. We plan to be actively involved in building this exciting new effort through membership on the Quality Steering Team as well as execution of the various responsibilities assigned to us.